Overview: Rosland Capital seems like one of the newer companies on the block, but they were founded in 2008 by Marin Aleksov, so they do have a track record established. They are located in Santa Monica with a business based on buying, selling and trading the popular forms of gold, silver, platinum, palladium, including numismatic coins. Rosland Capital plays it “down the middle” when it comes to their product offerings, and their website says they cater to all customers, those looking at bullion, coins and bars “to hold,” or those who wish to place their metals in a self-directed IRA. We also noticed a fair number of commemorative coins and other “premiums,” so we think it’s likely that Rosland prefers these kind of deals over straight bullion investing, although there is no direct statement to this effect that we could find. If you’re interested mostly in bullion, bear this in mind when you contact the company. 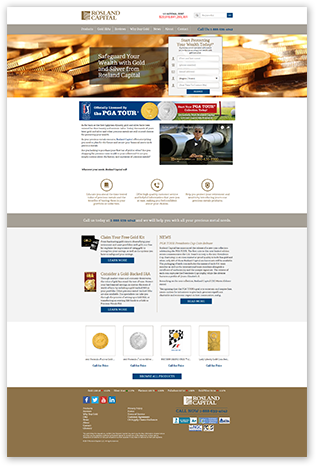 Our impression was that Rosland does not really differentiate themselves from their competitors in terms of offerings or products, and their home page “appeal” is for customers to protect their wealth through precious metals. While we admit this message resonates with us, it’s a familiar refrain that doesn’t really help express to the consumer just why they should prefer Rosland Capital services. What does immediately stand out is the company consistently seeks high profile ‘social proof’ public relations opportunities, such as their ongoing relationship with Actor William Devane as spokesman, who appears on the homepage in a video. We also noted a series of commemorative coins released in celebration of the PGA Tour and Formula One racing. These commemoratives no doubt create a great opportunity for Rosland Capital to rub shoulders with these popular brands and try to attract the upscale clientele associated with them. Unfortunately we were not able to locate a consolidated listing of common value-added services typically available on industry-leading websites (Storage Options, Buyback Policies, Pricing Policies, Shipping, etc.). Click to see how Rosland stacks up against the best gold companies! Rosland Capital’s site prominently features actor William DeVane on their homepage in an appeal to older investors. This trusted actor does indeed invoke the proper sense of seriousness in accord with the subject of the website, but our reviewer was underwhelmed with the site. They probably do not have the resources to compete with the likes of biggest competitors when it comes to marketing dollars, and it definitely shows – not in any lack of exciting visuals – their site looks just fine. However, our reviewer found a decided lack of quality content on the site. Engaging in social media sites may not necessarily improve the performance of your gold IRA company in terms of their trustworthiness or customer service. However, we do think it proves the company is engaged with their market and is making an active attempt to reach out to their audience in meaningful ways. There is a decided lack of general investing, or specific gold IRA investing background information on the Rosland Capital site that seems at odds with the company’s stated goal to “educate the public on the benefits of buying gold, silver, platinum, palladium, and other precious metals in physical form, and through Precious Metal-backed IRAs.” We are disappointed that they do not appear to take their credo to educate more seriously, but they do include an extensive “news” section that features press releases and other goings-on that this California company is undertaking. This company could have done better in our “Trust Factors” area, particularly it would be comforting to see fewer Rosland Capital complaints, although to their credit, they continue to maintain high ratings with BBB and BCA. We congratulate them on raising the BBB score to from A to A+ over the last year. However, we always like to see fewer negative complaints at TrustLink, which are presumably from customers that have used the company’s gold silver offerings. We found NO EVIDENCE of a systematic Rosland Capital rip off at work in these negative reviews, but we do feel obligated to mention it in case we missed something in our search.